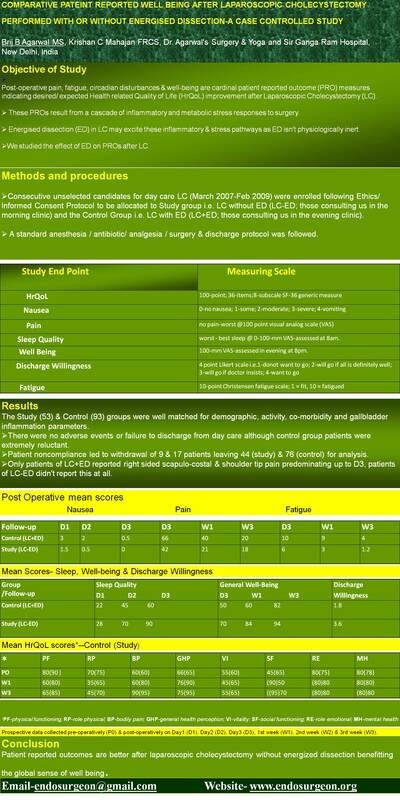 Post-operative pain, fatigue, circadian disturbances & well-being are cardinal patient reported outcome (PRO) measures indicating desired/ expected Health related Quality of Life (HrQoL) improvement after Laparoscopic Cholecystectomy (LC). These PROs result from a cascade of inflammatory and metabolic stress responses to surgery. Energised dissection (ED) in LC may excite these inflammatory & stress pathways as ED isn’t physiologically inert. We studied the effect of ED on PROs after LC. Consecutive unselected candidates for day care LC (March 2007-Feb 2009) were enrolled following Ethics/ Informed Consent Protocol to be allocated to Study group i.e. LC without ED (LC-ED; those consulting us in the morning clinic) and the Control Group i.e. LC with ED (LC+ED; those consulting us in the evening clinic). A standard anesthesia / antibiotic/ analgesia / surgery & discharge protocol was followed. worst – best sleep @ 0-100-mm VAS-assessed at 8am. 100-mm VAS-assessed in evening at 8pm. Prospective data collected pre-operatively (P0) & post-operatively on Day1 (D1), Day2 (D2), Day3 (D3), 1st week (W1), 2nd week (W2) & 3rd week (W3). The Study (53) & Control (93) groups were well matched for demographic, activity, co-morbidity and gallbladder inflammation parameters. There were no adverse events or failure to discharge from day care although control group patients were extremely reluctant. Patient noncompliance led to withdrawal of 9 & 17 patients leaving 44 (study) & 76 (control) for analysis. Only patients of LC+ED reported right sided scapulo-costal & shoulder tip pain predominating up to D3, patients of LC-ED didn’t report this at all. Patient reported outcomes are better after laparoscopic cholecystectomy without energized dissection benefitting the global sense of well being.